Has built-in bi-directional current sensing. 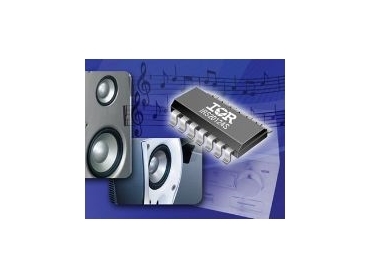 INTERNATIONAL Rectifier (IR) has released a 200V control IC developed specifically for class D audio applications up to 500W per channel, the IRS20124S. Integrated features such as adjustable dead-time generation and bi-directional over-current sensing protect the amplifier system. These features allow audio designers to simplify circuits and minimise component count for Class D audio amplifiers in home theatre entertainment systems, audio-video receivers and automotive sound systems. The internal, selectable dead-time generation circuit is thermally compensated for stability and is immune to noise and supply voltage fluctuations to help improve total harmonic distortion, or THD. The IRS20124S has built-in bi-directional current sensing and combines with an integrated shutdown function to protect the output Mosfets when an over-current condition occurs, such as a short-circuited speaker wire. "Circuit designers can reduce system footprints, improve PCB layouts, reduce EMI and improve thermal characteristics using IR's new Class D audio IC to drive audio Mosfets, such as the IRF6665," said Vice President, Consumer and Industrial Sector Business, David Tam. "Since Class D audio circuits need to deal with switching high voltage at high frequency, IR's expertise in optimising Mosfets and high voltage control ICs for switching applications is a perfect match to digital audio systems. “IR's application-specific devices enable higher efficiency, increased power density and better audio performance," added Mr Tam.